"Mendoza's dead. We just saw a worm thirty feet long." Willis O'Brien is the original stop-motion mastermind, having shot prehistoric creatures in such a painstaking frame-by-frame manner as early as 1914. Making a name for himself first with The Lost World (1925) and his magnum opus, King Kong (1933), he spent many of the ensuing years developing projects that sadly never got made. In the last few years before his 1962 death, however, he did make a few more stop-motion feature films, including this one, the best of his last works. Geologists Hank Scott (Richard Denning) and Dr. Arturo Ramos (Carlos Rivas) are assigned to investigate renewed volcanic activity near San Lorenzo in a remote area of Mexico. Once there, they find ominous signs of something unnaturally destructive and local legends about a Demon Bull. When they rescue Teresa Alvarez (Mara Corday), owner of the Miraflores ranch, they come face to face with the true culprits: a horde of gigantic scorpions sixty feet in length, against which guns are useless. Worst of all, these scorpions have an unfortunate craving for human blood, which sends them into a frenzy. O'Brien's effects work (and that of his assistants) is generally very good; the jerky movement of arthropods is peculiarly suited to stop-motion and the results are on the whole pretty convincing. There's an unfortunate disconnect between the closeups of the hideous faces of the scorpions and the appearance of the faces in long and medium shots, which don't appear nearly as ghastly. There's also a problem with continuity in cuts between wildly thrashing scorpions and quite still scorpion faces that is jarring if not downright annoying. Because of this one suspects that the faces are inserts demanded by the producers to make the scorpions seem nastier. The cast is adequate but nothing more. Richard Denning is essentially a very poor man's Glenn Ford and he pulls that limited role off well enough. Carlos Rivas' geologist seems like he doesn't know much since he has to keep being instructed by his norteamericano counterpart. Fairly surprising is Corday's character, who gives us a fiercely independent woman able to run a ranch and command the respect of her vaqueros. It's an interestingly written part and Corday does what she can with it. Unfortunately, also included in the mix is the mandatory annoying little boy stowaway, Juanito (Mario Navarro), who endangers everyone through his compulsive stupidity. One wonders why the scientists don't just feed him to the scorpions and be done with it. 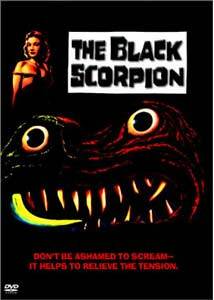 In general, unlike many such pictures, the film doesn't feel terribly padded, and the appearances of the scorpions are well-rationed throughout the running time. Particular standouts are their first attack, on some telephone repairmen, and a descent by the geologists into a fissure in order to find out where the scorpions are coming from. As giant bug movies from the 1950s go, this one isn't half bad. And as a surprising bonus, atomic power doesn't figure into the story at all: the gigantic creatures are entirely natural for a change. Image Transfer Review: The main issue with the source material relates to some of the effects shots; perhaps there are optical effects that resulted in damage to the negative, but these sequences are fairly scratchy and look noticeably worse than the rest of the film. The balance of the picture looks quite nice, with only mild speckling. It's very clear and detailed, without any significantly distracting edge enhancement. The black-and-white picture features a good greyscale range and rich, deep black levels with plenty of shadow detail. Audio Transfer Review: The 1.0 English mono track sounds quite nice, with mild background noise present, but very limited high frequency hiss. The noise is easy to disregard and the dialogue always stands out cleanly from the background. Music is as expected rather thin and tinny but it's not terrible. Overall, a good representation of a cheap 1950s soundtrack. Extras Review: The gem extra feature on this disc is some legendary footage that I never thought I'd ever get to see: the Willis O'Brien/Ray Harryhausen dinosaur footage (9m:51s) from the Irwin Allen documentary The Animal World. Although the feature is reportedly a lost film, the dinosaur footage has been known to survive, and this long-unseen footage has been written about extensively but almost never actually seen since the 1950s. But here it is, in a beautiful full-frame transfer, in its full color glory. The medium and long shots look terrific, though the closeups unfortunately reveal the miniature nature of the prehistoric monsters. It's quite clear that insufficient time was allowed to complete fine detail on the models, but the animation is nonetheless thrilling to see. Also included are some prefatory comments from Harryhausen himself as well as some production notes. Harryhausen also speaks in a featurette (3m:17s) about his mentor, O'Brien. This is far too short for a proper appreciation of O'Brien's work; one can only believe that Warner is holding back the good stuff for the eventual special edition of King Kong, whenever they get around to issuing that. The next nifty extra is some unused stop-motion test footage from about this period by O'Brien's principal assistant, Pete Peterson. The first and lengthiest features "The Las Vegas Monster," a giant mutant baboon that dismantles a house. Less substantial is a "beetleman" that moves Gollum-like across a mountain ridge. While nothing earth-shattering (or even complete), it's always interesting to see vintage stop-motion work of high quality. Finally, there are trailers for three Harryhausen films and the feature for added stop-motion fun. I wouldn't ordinarily grade this amount of content so high, but the Animal World footage is such an unexpected delight to own that it more than makes up for the lack of quantity. Despite a weak cast and some issues with the effects continuity, this manages to be a pretty effective little monster thriller. Some terrific extras make it worth any animation, sci-fi and horror fan's consideration.